Relax yourself in middle of nature near Annecy's lake. Discover or rediscover the practice of yoga in a beautiful setting facing the lake. 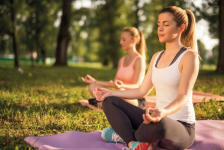 Combine sophrology exercises with a short walk in full awareness of the elements that surround us to reconnect with your body and its environment, replenish energy and vitality.